If the Scorpio season is a journey down to the roots of what matters, then perhaps the mid-point of Scorpio is the signal to return. The midpoint of Scorpio was reached on November 6. For the next two weeks, we acquire the lessons and gifts of that journey. Perhaps we also bring back knowledge of what our next work is. If we know what really matters, then we know what must be done. Perhaps for you it is about family, or perhaps water, or perhaps justice. For you, what really matters could be loving yourself unconditionally. Making art. Bringing healing. Speaking truth. I believe the world needs each of us to know what really matters to us. I believe we fulfill the contract with life by living ours fully. Scorpio is the season of death. From being touched by death, we discover what matters most about this life. I like the Scorpio awareness that differentiates between the surface and the depths. A lot that goes on at the surface is immaterial. The U.S. Presidential election, which finally finishes this week, fulfills that description. People can be manipulated easily by immaterial distraction. If we aren’t in touch with what really matters, we don’t know how to discern and choose wisely. It appears to me that the election process in the U.S. attempts to manipulate as many people as possible by keeping their awareness on the surface. However, with Scorpio eyes, we see that the candidates and the mainstream media are not talking about what really matters. And that perhaps frightens me the most. We need to acknowledge the real issues and perils of our world, which include climate change, racism, inequitable dispersal of resources, military aggression, and multiple injustices. The beauty of the Scorpio season is that we can develop the wisdom to see those who would manipulate us from the surface. By tuning into the Earth itself during this season, we follow the life force on its underworld journey. We sense into the mysterious veils that separate the seen and unseen worlds. We hear the timeless messages of the ancestors. We return with knowledge of what matters. This is power. Here is the message I am getting from this Scorpio investigation: Regardless of what happens on the surface, and it might seem really scary, don’t lose track of what you know, of what is important to you about life. The journey into death always affirms what really matters. The portals of fear and self-judgment sometimes keep us from going deeper. I recognize how hard it is to go past these barriers. Yet, I have learned in my 61 years of existence that when I do, I bring back the indomitable strength of life. We need such self-aware people to be fully in touch with their power in our world. We recognize this as spiritual wisdom, the essence of the artist, the nurturer of life and beauty, the warrior who stands up for the Earth. With Scorpio eyes, see these people around you and see this person in you. November 7—First Quarter Moon: Manifesting. Midpoints of fixed signs (Scorpio, Aquarius, Taurus, and Leo) are the feistiest parts of these essential anchors of the zodiac. If a fixed sign is an immutable force, then the midpoint of that sign is pretty darn sure of itself. The Sun is at the midpoint of Scorpio and the Moon reaches the midpoint of Aquarius today. Under this influence, we could see some people squaring off to protect intractable positions. This is an interesting ingredient to the last day of Presidential campaigning. Mental health practitioners have been reporting pre-election stress is greater during this campaign than ever before. We are feeling it today. The struggle between Scorpio depths and Aquarian vision is often one of style. Aquarius wants transparency. Scorpio keeps things hidden. Both are good. Both are necessary as we identify what really matters during this lunar cycle. If we slip into either/or thinking, then we lose the power of both. How do we honor the unseen while asking for greater accountability? As the Sun makes an encouraging sextile to Pluto in Capricorn today, we can trust that the journey into the depths is giving us the discernment we need to choose wisely. At the same time, we can bring to light, some of the ways those who do not want to be accountable have been working behind the scenes. Even on the last day of the campaign, secrets will be exposed. Tuesday, November 8. U.S. Election Day. The day starts under the influence of a waxing Aquarian Moon. There is a collective desire to bring change to the world. This is apparent, though not all agree on the type of change we need. Expect to see many strategies employed to bring about a desired outcome from all camps. Confusion may reign at the beginning when the Moon makes a square to Mercury in Scorpio. This is a temporary influence. 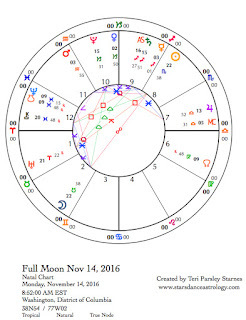 However, the Moon moving into Pisces mid-afternoon (Central time zone) may dampen activist fervor. Voting turnout could slack if people just want to give up. At the end of the day, Mars moves into Aquarius. Groups are energized one way or another by the outcome of the election. Mars fuels a desire to work for change. Wednesday, November 9. We might be feeling a strong desire to retreat, to recover, after the stress of the election. The Moon in Pisces encourages self-care. This Moon conjoins Neptune early in the day and then makes a square to Saturn. We might want to tune out and then feel an obligation to tune back in. Honor your emotions. However you see the struggle of our times, know that the work will still be there if you take a break. We feel a deep longing for connection. This may be expressed as a desire to begin healing divisions. Thursday, November 10. Today the Moon conjoins Chiron in Pisces. Emotions surface. If the Scorpio (fixed water) lunar cycle helps us to touch upon emotional depth, then the Moon and Chiron in Pisces (mutable water) help us to release those deeper feelings. Water is the teacher and the precious source of life. Water issues may surface today as well. With the election over, perhaps a new response to the water protectors of Standing Rock will happen today. All water issues are connected. A square between the Moon and Venus in Sagittarius highlights a division between action and values. When the Moon moves into Aries later today, we feel a desire to protect and fight for what we value. November 11—Gibbous Moon: Perfecting. The tension between knowing what matters and fighting for what matters fuels this phase of the Scorpio lunar cycle. Under the perfecting influence of the gibbous Moon, we feel the desire to keep pushing for the wisdom of the depths. The Moon is waxing. On November 14, the Full Moon will illuminate our desires and the wisdom we’ve earned through a long journey to the depths. The Aries Moon encourages the fighter in us. This inner fighter will do well to pause and reflect on what has been learned the last two weeks of this Scorpio lunar cycle. An opposition between Jupiter in Libra and the Moon may provoke us to act before such consideration. Notice impulsivity. A square between the Moon and Pluto in Capricorn interjects power issues. What is true power? Remember that Scorpio encourages an awareness of what lies underneath surface reality. True power comes from acknowledging a deeper and greater source of wisdom. Venus moves into Capricorn today. The value is on effective leadership and results. Venus is exalted in this place of power where we know what really matters and what is at stake. Saturday, November 12. The agitating energy of the Moon in Aries conjunct Uranus during the night may have us waking cranky this morning. This mood shifts when Mercury enters Sagittarius, giving us something to aim for. If you are dissatisfied with the status quo, then what are you going to do about it? Important information comes from how we are feeling. The Sun in Scorpio trines Chiron in Pisces. Water issues rise to the surface. Perhaps vulnerability is seen as a strength. Later tonight, the Moon moves into Taurus. Grounded certainty comes from previous emotional work. We are building up to a potent Full Moon on the 14th. Feel, already, the illumination of the deep soul searching of the Scorpio season. Sunday, November 13. Try to see the Moon rise tonight. The supermoon Full Moon, exact tomorrow morning, will be stunning tonight. The Moon’s orbit is not perfectly circular. Each month at perigee, the Moon comes closer to the Earth. When this point occurs at a full or new moon, it is called a supermoon. This particular one is even closer than usual. According to Earthand Sky , it hasn’t been this close at a Full Moon since 1948 and won’t be this close at a full moon again until 2034. Expect to howl at this Moon. We’ve been holding a lot of tension around the election. The season of Scorpio reminds us of inevitable death. The barriers between the seen and unseen worlds have been thin and we may be feeling a bit exposed. What a great opportunity to release all that into the light of this spectacular Moon. More reason to release tension: The Sun in Scorpio makes a quincunx to Uranus in Aries today. We’ve been tussling all week between the energies of revolution and resolution. Under Scorpio influence, we want to go deep and be solid in our values. Under Uranus/Aries influence, we impetuously want to shake things up to see what happens. Both are present as we release paradox into the Taurus Moon’s light. November 14—Full Moon: Illumination. I hope you got to see the Taurus supermoon last night. (See yesterday’s forecast.) This morning, the Full Moon is exact (in the central time zone) as the Moon in Taurus reaches the opposite position in the zodiac from the Sun in Scorpio. Full Moons are illuminating not only because the full face of the Moon is lit up but also because an opposition brings illuminating insight through the power of mirroring. Scorpio and Taurus are mirrors for each other. These fixed signs, holding down their quadrants of the year, link death to life and life to death. Opposite signs mirror wholeness to each other. These signs help us realize that the life, death, rebirth process is an innate pattern in our experiences. Full Moons help us to realize that there is no binary of either/or but only pulsations between polarities. Continuums. Cycles. Wheels. Patterns. This is an opportunity is to see where we are in our personal journeys. Today’s Full Moon calls us back from deeper and darker places. Taurus anchors the season of spring when life floods back from the quiet of winter. Do you feel a surge of life rushing back right now? It is good to recall how this feels because we are headed into winter in the Northern Hemisphere. The quiet and fertile darkness will be with us for a while. This Moon is a reminder the wheel keeps turning. Life will reemerge. Perhaps that awareness helps you to relax a bit more into the Scorpio journey of this lunar cycle, which is only halfway complete. I’ve been guided in this journey by the question, What really matters? It is comforting for me to know that the eternal cycle of life, death, and rebirth is bigger than me, bigger than elections, bigger than governments. This comfort gives me access to what Taurus is brilliant at: grounding us into the wisdom of the Earth and our bodies. Remember this place. 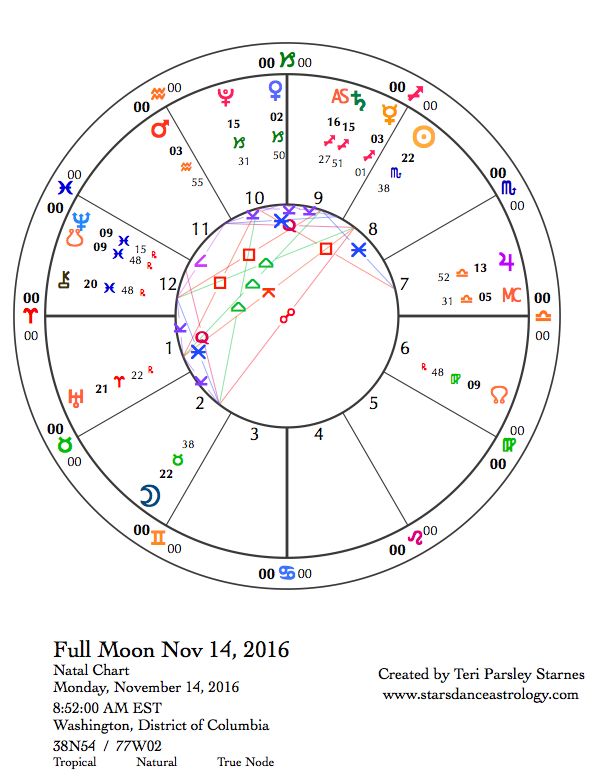 In the Full Moon chart, Neptune in Pisces exactly conjoins the south node of the Moon. The south node points to the past, to hard lessons, experiences that have held us back. There is a karmic association with this point. As the “Great Unbinder,” Neptune helps us let go. This is tricky, however, because Neptune can also lead us right back into the choices that brought us to this crossroads—escapism and delusion. Perhaps the middle road and the antidote may be to approach our mistakes with new levels of accountability. Shame is a distraction in this healing process. Can we surrender and accept responsibility at the same time? The answer to this paradox may come from the ancestral realms during this Scorpio season. Another feature of this chart to note is that Jupiter in Libra will soon be making the first of three squares to Pluto in Capricorn (November 24). (In December, Jupiter will make the first of three oppositions to Uranus in Aries.) Jupiter is sounding the trumpet for justice and balance. Inequities are hard to tolerate. The Pluto connection exposes more injustice from those in power. Illuminations from this Full Moon give the resources we need to correct those imbalances. To read about the beginning of the Scorpio lunar cycle go to Starsdance Astrology. Thanks Teri.. Love your insights. these sure are Scorpio times.